Cast polyurethanes are processed in a liquid state. That is, the individual components of the system are liquified before mixing and then cast into a mold or poured onto a surface to allow the cure to advance to a solid state. Upon completion of the initial cure in the mold, the articles can be transferred for a post-curing stage to complete the reaction and achieve the desired properties. 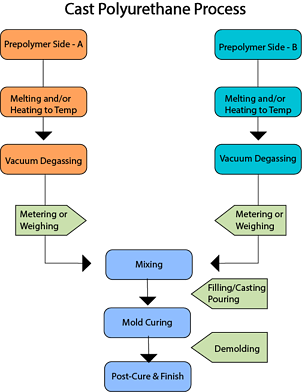 The figure below outlines the cast polyurethane process steps. Processing conditions have a significant impact on the final properties of the cast polyurethane, regardless of the system. Two of the processing parameters that have a critical impact on the performance of the polyurethane/urea systems are the temperature and the ratio of the prepolymer to the curative. The amount of curative required to match the stoichiometry of the prepolymer is generally selected to improve a specific set of properties (e.g., tensile strength, tear and abrasion resistance, and more) and needs to be adhered to in the metering and mixing process. In this blog, we will address the temperature requirements to effectively work with curatives such as diols, diamines, and formulated products used as chain extenders and curatives in polyurethane/urea systems. Many cast polyurethane systems utilize solid curatives, such as MOCA, MCDEA, HQEE, and HER, and these curatives must be melted and processed in a liquid state. Below are the temperature requirements to follow for these chain extenders. MOCA is a widely used curative in the hot cast process, especially with TDI prepolymers. It delivers polymers with excellent high-temperature property retention and good dynamic performance. Relative to other diamine curatives such as MBOEA, MCDEA, and DETDA, MOCA exhibits lower reactivity and a longer working life. See the chart below. The melting point of MOCA is 98–102°C (208–216°F). Accordingly, the nominal operating temperature for a MOCA melter should be from 110 to 120°C (230–248°F). Because MOCA will decompose when exposed to higher temperatures, avoid heating MOCA above 125°C (257°F). MCDEA is an outstanding solid aromatic diamine curative for high-performance cast polyurethane applications. It affords improved dynamic mechanical properties and low hysteresis. MCDEA-based formulations generally exhibit good abrasion resistance, good resilience and tear strength properties, and good processing characteristics. Typically, these properties are valuable in industrial wheels and tires, sport and amusement park wheels and rollers, industrial rolls, and conveyor belts. The melting point of MCDEA is 87–90°C (189–194°F). Accordingly, the nominal processing temperature for MCDEA should be from 95–110°C (203–230°F), typically 100°C (212°F). MCDEA exhibits higher reactivity than MOCA. Consequently, the pot life of MCDEA/TDI systems is shorter compared to MOCA/TDI systems. HQEE is an aromatic diol chain extender for MDI prepolymer systems, creating polyurethane elastomers with excellent dynamic properties, good split tear resistance, and high resiliency. The HQEE/MDI elastomer series can parallel many of the performance attributes of MOCA/TDI systems. Applications for MDI/HQEE elastomers include industrial wheels and tires, sport and amusement park wheels, pipe linings and coatings, rollers, industrial roll covers, gaskets, oil-field seals, and other high-performance end uses. However, there are difficulties associated with processing HQEE due to its high melting point, ~98°C (~208°F), and the fact that HQEE does not supercool (HQEE will crystallize quickly below its melting point). Accordingly, it is important to uniformly heat and mildly agitate HQEE in the melting tank and preheat the prepolymer to 90°C (194°F) or above before mixing HQEE in. In addition, all HQEE transfer lines should be heated to 110°C (230°F) and insulated to prevent cold spots that might cause HQEE to crystallize in the lines and result in an inaccurate mix ratio. The temperature of the mold should be 110°C (230°F) or higher to prevent defects in the cast parts. Another processing challenge encountered with HQEE as a chain extender is a phenomenon called “starring” on the surface of parts. This phenomenon has been attributed to the phaseout of the reaction product of HQEE and free MDI monomer, especially on mold surfaces at temperatures lower than 110°C (230°F). It has been reported that low free MDI prepolymers exhibit a much lower tendency to starring because of the lower free MDI monomer content. In some cases, other diols like HER or PTMEG can be added in small amounts to HQEE to facilitate maintaining a molten state. HER is an isomeric counterpart of HQEE and another aromatic diol chain extender for MDI prepolymer systems. The properties of HER extended MDI prepolymers are comparable to those of HQEE. However, HER has a lower melting point of 89°C (192°F) and the ability to supercool, which offer significant processing advantages versus HQEE: lower processing temperatures, a broader processing temperature window, the absence of “starring,” and a lower tendency to crystallize in processing equipment. After melting at 90–100°C (194–212°F), the HER temperature can be reduced to about 80°C (176°F) without crystallization. In urethane elastomers, HER affords excellent mechanical properties; toughness; very good tear, cut, and abrasion resistance; and good resiliency. Applications are the same as those of HQEE, including industrial wheels and tires, sport wheels, die-forming pads and coatings, rollers, industrial roll covers, gaskets, oil-field seals, conveyor parts, and other high-performance end uses. Some curatives for cast polyurethane systems are in a liquid state at room temperature, but their viscosity may be too high for efficient mixing with the prepolymer. In such cases, the curative temperature usually needs to be increased to reduce its viscosity. Below are the temperature requirements for several liquid diamine and diol curatives used in cast polyurethane systems. Some commonly used liquid aromatic diamine curatives are DETDA, DMTDA, MBOEA, and P-1000. These diamines have the advantage of allowing processing at lower temperatures. However, it is known that higher temperature cures can result in improved tensile strength as well as tear and abrasion resistance. DETDA and MBOEA exhibit very fast cure rates and short pot lives with TDI prepolymers. DMTDA has a lower reactivity and exhibits a workable pot life at 100°C (212°F) comparable to that of MOCA/TDI systems. Blends of diamine curatives, such as MBOEA with DETDA, can reduce the overall viscosity and improve flow at lower temperatures. P-1000 is a polymeric diamine curative that’s a viscous liquid at room temperature and exhibits a much lower reactivity in TDI systems; it can also be used in MDI systems. P-2000 is a waxy solid at ambient temperatures with a melting point in the 18–23°C range. Both curatives benefit from processing at higher temperatures where the viscosity is reduced. Liquid diol chain extenders such as 1,4-butanediol (BDO) and 2-methyl-1,3-propanediol (MPO) can be used in MDI-based cast polyurethane systems at room temperature. Processing temperature and catalyst loading levels impact the pot life of diol/MDI systems. Uncatalyzed systems can have a pot life of 10–20 minutes at 70°C; however, processing at higher temperatures or using catalysts will significantly reduce the pot life. When processing cast polyurethane systems, it’s important to note that BDO freezes at 20°C (68°F). Therefore, it needs to be maintained above the freezing point to avoid crystallization in the equipment lines and phase separation in a B-side formulation. MPO is another liquid primary-diol chain extender with a freezing point of -54°C. As a BDO isomer, it has identical molecular and equivalent weights as BDO, but it offers better compatibility with both polyester- and polyether-based prepolymers. It should be noted that the resulting elastomer will be softer compared to the one produced with BDO and will exhibit better hydrolytic stability. The reactivity of MPO is only slightly slower than that of BDO, and processors have used blends of BDO with MPO. 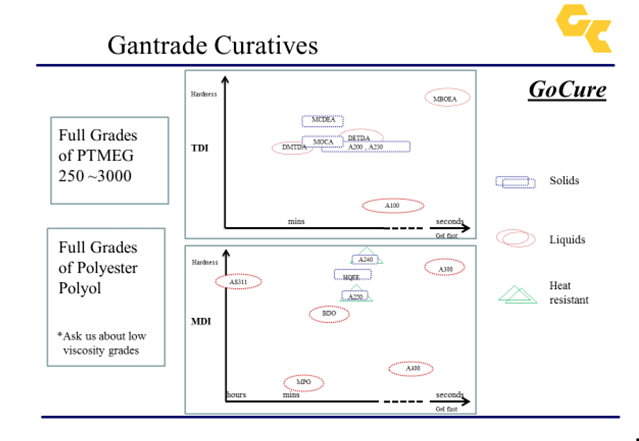 Whether you want to purchase these curatives or desire additional information on how to use them properly, contact Gantrade Corporation to gain the expertise and support of our technical team.